This past Saturday Sasha turned three. I can not believe how the time has just flown by. At times I miss baby Sasha, but watching her grown and learn has been so much fun. Everyday I am impressed with what she has learned or what she has figured out to do. I am slightly biased, but I think she is the smartest little three year old. Last year Sasha wanted an Elmo cake, and I created an Elmo cake for her. This year she wanted a fiesta. She gave me a theme and I ran with it. We started out with various dips for appetizers. I made pico de gallo, guacamole, black bean & corn salsa, and a layered bean dip. For our main dish I made chicken tamales, Mexican rice and my own “refried” beans. Everything was so delicious. To a three year old the most important parts are the cake and the presents. Awhile back I saw this AWESOME cake and I knew I had to make this for Sasha’s birthday cake. 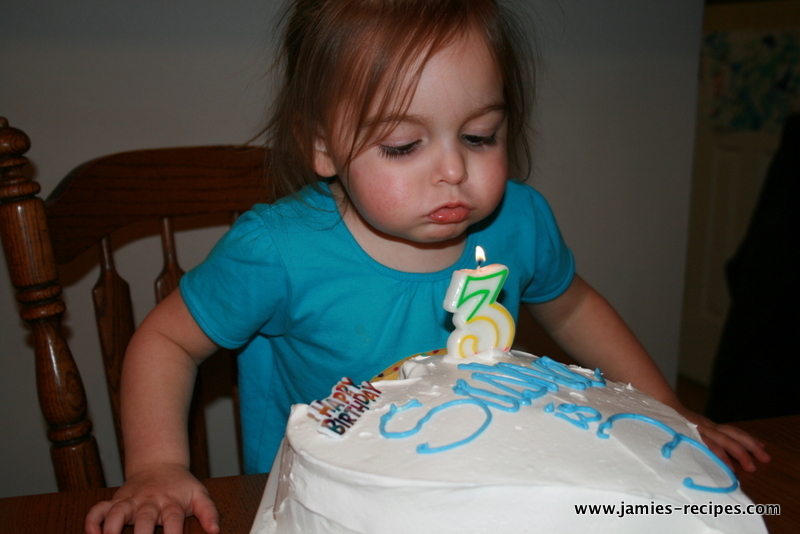 She loved it, and it was fun hearing the ooo’s and aahh’s when we sliced in to it, no one had a clue what was under that whipped cream frosting. We surprised Sasha with a piÃ±ata, something she specifically asked for. It was fun watching her trying with all her might to break it open. Preheat oven according to directions on box. Mix together 1 can Sprite with one box cake mix. Divide cake mix into three different bowls. Stir in red (we had pink) in one bowl, yellow in another and orange in the last one. Place the red mix down first, then orange and finally yellow. Bake according to directions, I think mine took about 29 minutes. Mix together the other can of Sprite and cake mix. Divide batter into thirds, mix in blue in one, green in another and purple in the last one. Layer green, blue and finally purple. Bake. Mix together 1 container Cool Whip with pudding mix (save a little if you want to write on the cake). Spread on top of the first cake, stack second cake on top. Cover both cakes with the remaining container of Cool Whip. ENJOY! 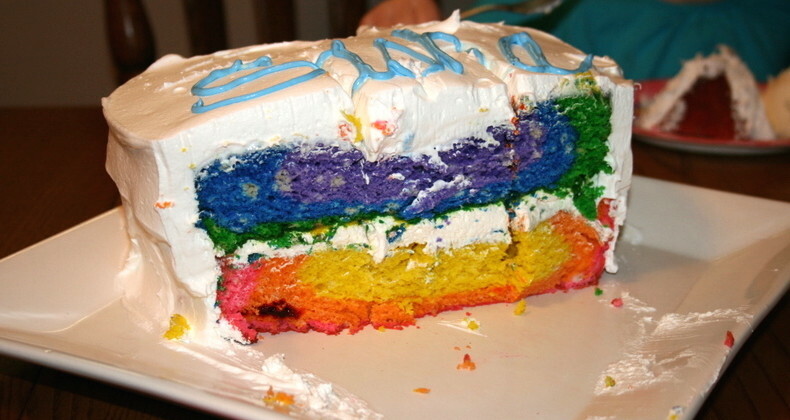 That cake is awesome…….And those cinnamon rolls……..I shall make them SOON. LOVE the cake! It turned out really well. I added your blog to my reader and am looking forward to trying out some new recipes! Thanks!